There are many times in a project or a tasks lifecycle when we need to upload several documents at once. Whether it’s updating a task with screenshots explaining the work to be completed or adding files to a project for the copywriter, the ability to upload all of these documents at once is a welcome and speedy alternative to uploading documents one at a time. 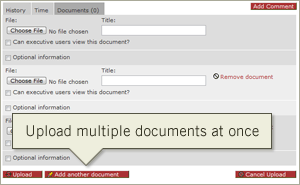 With multiple uploads you can add all of your documents, images and other files to a task or project all on one page. 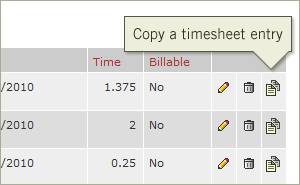 One of our most requested features these last few months has been the ability to copy time entries on the weekly timesheet. For those of us who perform some of the same tasks in our day-to-day workflow, time management will go much quicker with the copy feature. Simply click the copy icon to copy your time tracking entry from one hour to the next. Every small business, creative agency and freelancer has moments of clarity when they realize they’ve created the same task several times. 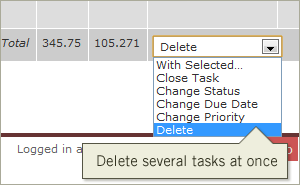 Now, instead of delete-wait-delete-wait-delete-wait, you can remove several tasks at once with a click-click-click-delete-wait. It’s like spring cleaning, but for your online tasks. Same thing as above. A faster way to quickly remove unwanted documents. This feature makes it easier to manage and clean up old documents — especially if you are trying to stay within your current plan, or if you prefer to remove documents after a project is complete. It’s your calendar so we are letting you decide what dates it should display. Projects and tasks rarely fit nicely into the one month silos that calendars enforce. Filter the calendar according to your own date range to line it up with your next project timeline, your next sprint, or to see how many milestones are due this quarter. 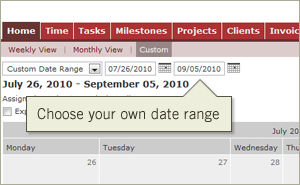 Flexible date ranges make the home tab far more versatile for project, milestone and task scheduling. 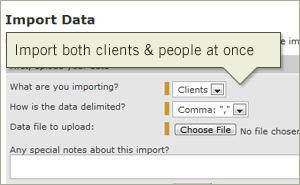 Ever since we launched the ability to import clients and people separately, we keep finding ourselves asking “why not import both at the same time?” Now it’s possible. As you first get started using Intervals you will find the ability to import clients and people at once a great time saver. At Pelago we have a client list topping 100, with anywhere from one to five contacts with each client. Now other web designers, developers and creatives like us can import large lists of clients and people quickly and easily, so we can focus on the more important things like projects and tasks. One of the bigger challenges in designing and developing online project management software is that there is no common denominator in regards to screen resolution. If you design for the lowest resolution you leave those with higher resolutions staring at blank space. And if you design for the middle to highest resolution you require those with lower resolutions to use the horizontal scroll bar. Our solution was to do what most web designers would do, design and develop for the lowest common denominator. But we didn’t stop there. We’ve added a feature we call the “widescreen view” for those with wider screen resolutions who wish to see more information. 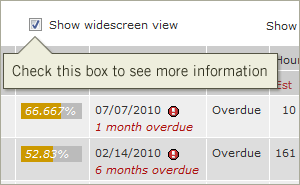 Check the box on the milestones page and several more columns appear, giving you more of the information-at-a-glance you want and need. This feature first debuted on the task list and will be added to other lists in the near future. Great work on the calendar option! This will be very helpful.